You know when you put an outfit together and just fall completely, head-over-heels in love with it? This was one of those days. I bought this River Island dress in the sale a couple of weeks ago, after debating buying the t shirt (which is now also in the sale) and then deciding I'd get much more wear out of the dress. It was only a tenner and I absolutely love it, it's so comfy and easy to wear. 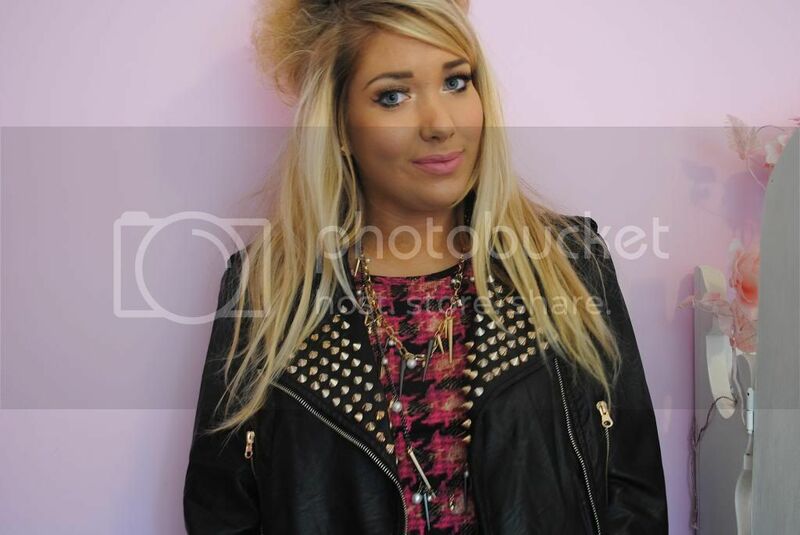 I paired it with my goooorgeous studded biker jacket I was sent from Missguided a few days ago - I am seriously IN LOVE with this jacket. I'd been on the hunt for the 'perfect' studded jacket and couldn't find the right one anywhere - I'd debated buying a Primark spesh and studding it up myself, but I knew it would never look right, and I wanted a jacket I could keep and love for years to come. So when I spied this on Missguided's website I immediately had to have it. It's perfectly on trend with the studding, plus its detailing is gold which is always a win for me, and I know it will go with so many of my outfits. Bought the spiky/skull necklace from Primark - they've been a bit hit and miss with jewellery lately, but I think they're getting back to how they used to be. I've been wearing this necklace non-stop lately - it goes with everything and is perfect for rocking up a plain dress/t shirt. Not that you can see, but I wore this with my favourite gold studded tights from Pamela Mann (I'm wearing them in this post) - slightly a gold stud overkill but I love it!